Rainy day activities for kids are an important part of home life this time of year. It’s official: rainy days are here, and as they say, “April showers, bring May flowers”. It’s been a long winter here in New York, and although spring has arrived, the sunshine has yet to always follow. My little one, Penelope, can’t wait to get in some outdoor fun. So we’ve decided that we won’t let a little rain get in our way. Ready to start the season, Penny and her best friend Noah brought the outdoor fun inside the home, and enjoyed a terrific day filled with imaginative pretend rainy day activities for kids! 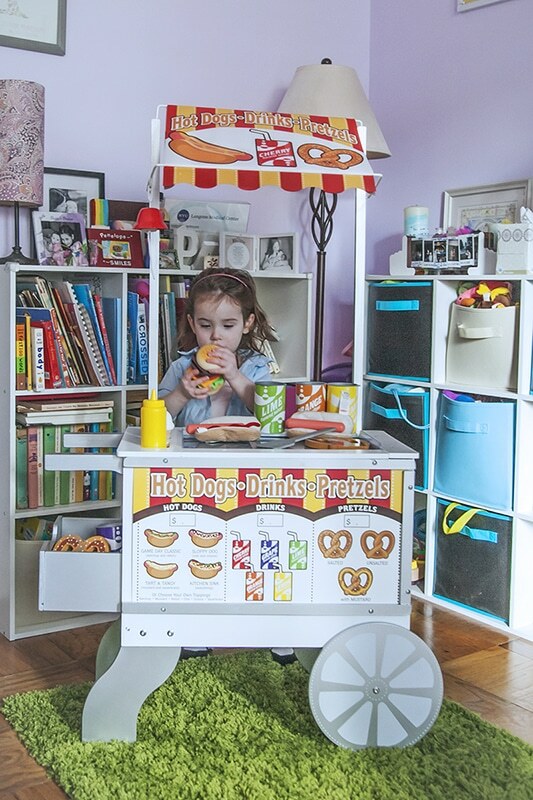 Nothing says sunny days like a food old-fashioned hot dog cart and ice cream stand. The Snacks & Sweets Food Cart is the perfect way to ring in the sunnier seasons. This rolling snack cart offers hours of outdoor fun inside and outside the home. Adorable as it is versatile, with just a flip of the awning and display menu, Penny and Noah went from serving up hot dogs and pretzels to ice cream and ice pops in seconds! The set comes stocked with all sorts of fun goodies (40 pieces, in fact! ), but also leaves plenty of room in its storage drawers to stow away more of our favorite treats from Melissa & Doug. The best part? Ringing the bell that hangs from the awning. 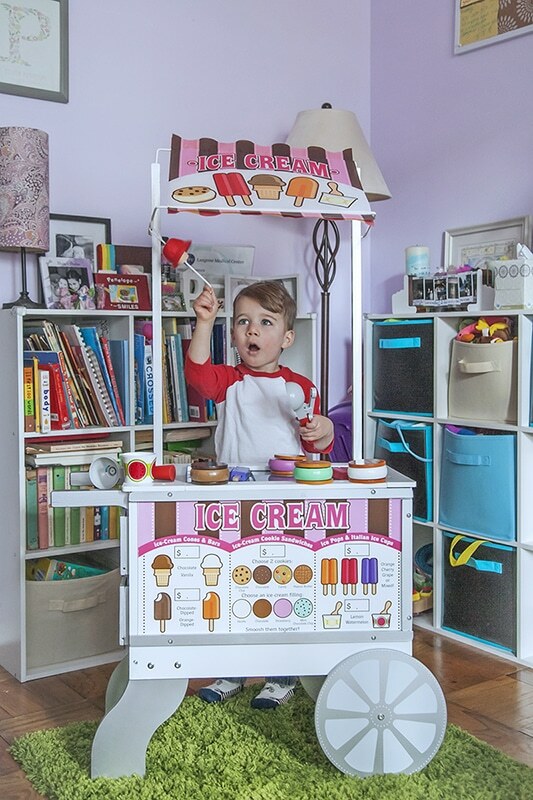 Penny couldn’t help but call out, “Get your ice cream here!” as she welcomed her customers to the snack cart. The pair really enjoyed preparing their custom creations such as a salted soft pretzel with mustard, and decadent ice cream sandwiches! Although they were playing and having fun, Penny and Noah were also learning a great deal in the process. We asked them questions like, “How are these two soft pretzels different?” and “Can you count how many different flavors of ice cream there are?” The sliding see-through doors at the top surface really brought the experience to life, as Penny and Noah reached in to select their toppings. So excited about preparing food from the Snacks & Sweets Food Cart, Penny and Noah were ready to BBQ! In playing with the Rotisserie & Grill Barbeque Set, they fired up chicken, fish, and sausage pieces that are connected by self-stick tabs, and used the play utensils to grasp, flip, and cut the pieces apart for serving. Discovering his inner grill master, Noah used the basting brush to marinate his shrimp and veggie skewer. While Penny enjoyed seasoning the rotisserie chicken with BBQ sauce. Rainy day activities have turned my little man into a grill master! 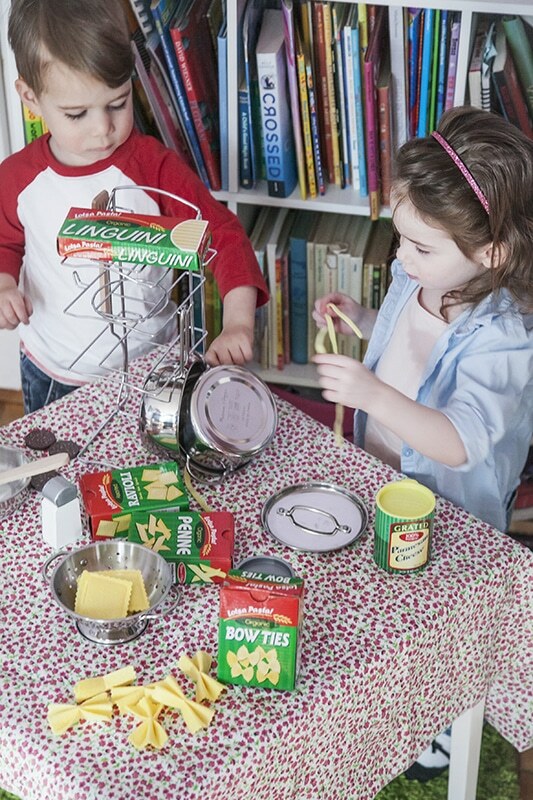 Adding a starchy side to the meal, the kids had a blast with the Prepare & Serve Pasta Set. Bow ties, penne, linguini, or ravioli- there was no need to choose! 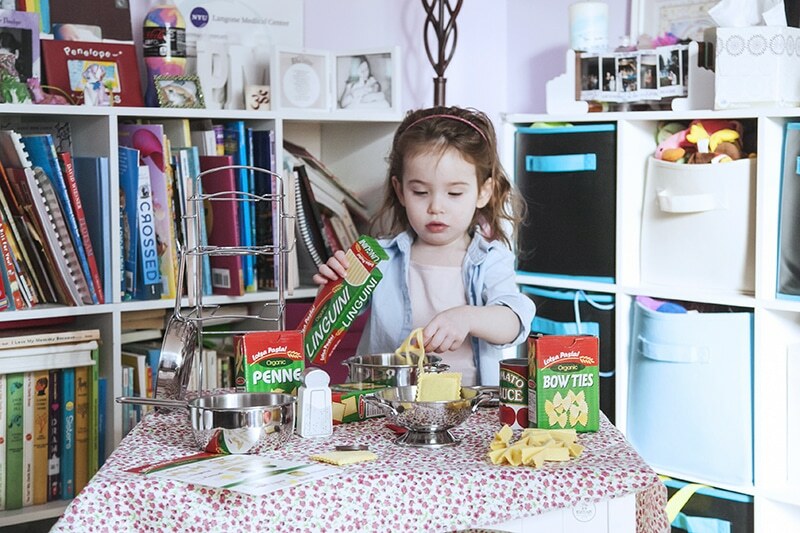 Penny and Noah discovered the many different forms that pasta comes in. They even customized their ravioli with spinach, meat, and cheese fillings. Then a little tomato sauce, butter, and salt where they felt it was needed. The possibilities and opportunities for imaginative play were absolutely endless. As part of the process, they strained, cooked, transferred, and plated the pasta to create the perfect meal. As any professional chef would have it, the experience was enhanced by the Let’s Play House! Stainless Steel Pots & Pans Play Set, which is beautifully organized on its accompanying storage rack. Chef Penny and Chef Noah were in all their glory! After serving their customers and treating themselves to a hearty meal, Penny and Noah winded down their playdate with some nice, relaxing quiet time to color and learn. The Jumbo Triangular Crayons were the perfect accompaniment to the Big Picture Floor Pad A to Z, which is perfect for these two preschoolers that love both coloring and exploring the alphabet. The Water WOW! Alphabet Cards and Water WOW! Colors & Shapes Water Reveal Pad served as mess-free magic for the BFFs, and as parents, we loved that they were learning as they were having fun. It was easy for them to lay the Water WOW! activities on the floor, and great for us as parents when we later packed them in our bags for on-the-go travel entertainment as we braved the rainy day outdoors. 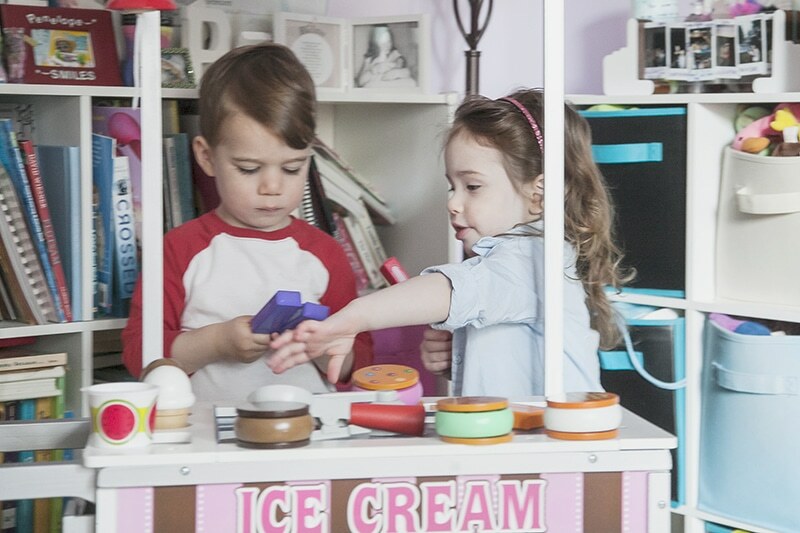 Penny and Noah had a great playdate filled with rainy day activities that promoted fun and learning. A big thanks to Melissa & Doug for setting the scene of this perfect indoor day with their amazing toys and creative tools. OMG! These kids are so cute!The post is awesome. Thnks for sharing. My Twin will like this idea!